Crimpless, High Performance Angled Gold Pin Connector. Special Lock-Notch design that won't pull out of push-pin terminal connections. Patented 60 degree angle on regular size reduces stress between pin and cable. New OmniFlex connector allows bending and flexing in all directions for easy installation. Ideal for hard-to-get-to connections on back of amps and receivers. High-integrity maximum signal transfer connection. Simple and easy to terminate without tools. 24K gold contact surfaces for long-lasting high conductivity and for maximum signal transfer without distortion. For original Monster cable. Will hold 12 gauge cable. 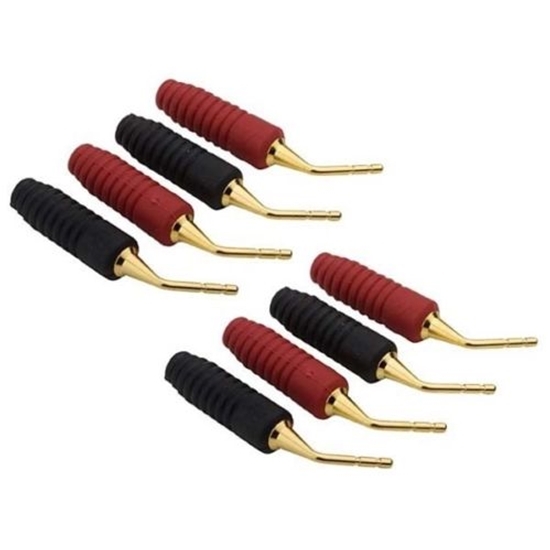 4 Red Jacket and 4 Black Jacket Monster Cable Angled Pin Connectors.